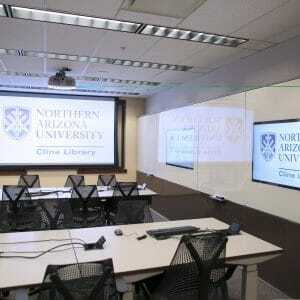 What is the Learning Studio at NAU’s Cline Library? The Cline Library’s Learning Studio (Room 249) is a highly configurable, advanced technology classroom designed to support student-centered learning. The Learning Studio seats 70 and includes over 2300 square feet of space. Equipment and other features support active learning, group work, and the seamless use of personal devices. On-site technology staff are always available to provide support. The Learning Studio is first and foremost a classroom. Classes will be scheduled in the Learning Studio based on enrollment size (generally > 50) and demonstrated need for the design of the room and available technology. To request the Learning Studio for your regularly scheduled classes, please contact your department’s class scheduler. 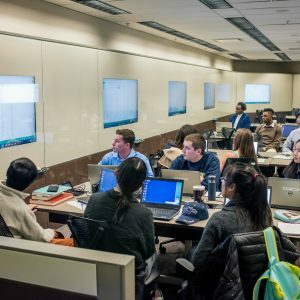 The Learning Studio may also be booked for university events outside of regularly scheduled classes by members of the NAU community if there is a demonstrated need for the design of the room and available technology. The Learning Studio offers an array of technologies controlled with an easy-to-use interface. Features include seating and laptops for 70 students, an 85” 4K display plus two projection screens, fixed and mobile tables for flexible group work, writable glass, videoconferencing, and support for personal devices. 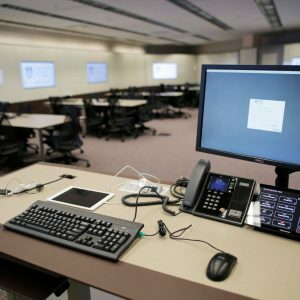 Instructors can push content from a lectern computer or their own device to any or all of the displays in the room or share student work from one student group’s display to the displays of other groups around the room—all managed via a simple, wireless interface.